Washington, D.C., , 2018-May-18 — /Travel PR News/ — Autograph Collection, Marriott International’s distinctive collection of thoughtfully designed independent hotels, today welcomed 5 African Pride Hotels to its global portfolio, marking the debut of the brand in South Africa. These hotels include, African Pride Melrose Arch Hotel, African Pride 15 On Orange Hotel, African Pride Mount Grace Country House & Spa, African Pride Irene Country Lodge, Arabella Hotel & Spa, Arabella Country Estate. From contemporary urban to boutique country houses, each of these hotels offers travellers an enviable range of artistic, culinary and cultural adventures with a unique character and a defining sense of place. 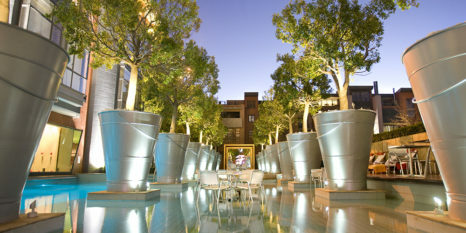 Ideally situated in the heart of Johannesburg, the 118 room African Pride Melrose Arch Hotel, Autograph Collection is a unique blend of chic design and outstanding service. Located in a bustling neighborhood, brimming with cafés, al fresco dining, high street fashion and more, the hotel sets the tone for a distinctly contemporary urban experience within a pulsating city. Dine at the March Restaurant that offers global cuisine, or linger by the fire at the Library Bar over a drink or simply lounge by the crystal waters of the outdoor pool and be inspired by the oversized buckets and mirrors and the surprise design pop ups throughout the hotel that heighten the unique character and style of this hotel. Set in the trendy Gardens area of Cape Town, African Pride 15 On Orange Hotel, Autograph Collection, is just a short distance from the city center and offers convenient access to the city’s world-famous landmarks. With 129 contemporary rooms, the hotel reflects a quirky style and stand-out decor. Soak up the Cape Town sun at the rooftop pool, indulge in a globally inspired menu at Savour, sip a cocktail in the elevated chandelier pod while enjoying panoramic views of the majestic Table Mountain or pamper yourself with a relaxing spa, African Pride 15 On Orange, Autograph Collection is ideal to experience the hip and happening vibe of the dynamic city of Cape Town. Nestled amongst the ruggedly beautiful Magaliesburg Mountains, merely an hour’s drive from Johannesburg and Pretoria. the 121 room African Pride Mount Grace Country House & Spa, Autograph Collection, offers a serene country escape. Ignite the imagination and rediscover yourself in the serene gardens of the famed hydrotherapy spa. Relax in the Jacuzzi while listening to the soothing sound of the waterfall or escape in the sound flotation pool and let time fade away. Relish wholesome fresh food that showcases seasonal fruits and vegetables perfectly complementing the relaxing spa treatments at the Spa Café, indulge in delicious country garden style food with a chic flair at the award-winning Rambling Vine restaurant that features quarterly seasonal menus and an award winning wine list or try a ‘fun’ meal at Twist where unlike other restaurants, the kitchen is brought into the restaurant with an unusual buffet style offering. The charming country setting makes this experience truly special. In the quaint and historical village of Irene, in the heart of Gauteng, South Africa’s economic capital, lies African Pride Irene Country Lodge, Autograph Collection, a haven of peace and tranquility. The scenic long and winding oak- lined lane leading up to the lodge’s entrance leaves you feeling like you’ve left the city without actually having done so. With beautiful lakeside views, the lodge boasts of 75 spacious rooms a range of dining options and an award winning Spa. Irene is known for its roots in art and culture and the local markets are a testament to the creativity that abounds here. Irene Farm across the road from African Pride Irene Country Lodge, Autograph Collection provides an authentic country experience, where dairy cows are milked daily and the local shop stocks an abundance of farm fresh delicacies. Situated in the heart of the Kogelberg Biosphere, close to Hermanus’ the world-famous whale watching destination, the 145 room Arabella Hotel & Spa, Arabella Country Estate, Autograph Collection overlooks a spectacularly attractive natural lagoon, surrounded by a lush landscape. The hotel boasts a 18-hole golf course designed by Peter Matkovich, ranked amongst the best in the country, exquisite on-site dining options, an award winning spa, a fully equipped fitness center, multiple swimming pools and more. Just an hour away from Cape Town, the Estate places you near a wide selection of outdoor adventure activities that provide enough and ore for an adrenaline rush. Marriott International currently operates 3 Autograph Collection Hotels in Middle East and Africa which include La Pita Hotel Dubai, Autograph Collection, La Ville Hotel & Suites City Walk Dubai, Autograph Collection and Habtoor Grand Resort Dubai, Autograph Collection. The brand is gaining traction in the region and is set to make a debut in Algeria later this year. This entry was posted in Hospitality, Hotels, Travel, Travel Management, Travel Services, Travelers and tagged African Pride Hotels, Alex Kyriakidis, Autograph Collection, Marriott International, Neal Jones, South Africa. Bookmark the permalink.